Recently, I solved a clutch problem with my 1959 Mercedes-Benz Type 220S sedan. The clutch linkage should be similar on all Mercedes-Benz Ponton models, but please let me know of any variations you encounter. The problem my car had is called a DRAGGING CLUTCH. It began as unavoidable grinding of gears when I tried to shift into reverse gear. Then it developed into the clutch not disengaging the drive train, even with the pedal pressed all the way to the floor. The car was behaving difficult at stop signs, shifting gears with difficulty, and the final warning was when I almost ran into the workbench when pulling my car into the garage. The car would not stop its forward motion with the clutch pedal pressed hard to the floor! The above problem can also be diagnosed as too much clutch pedal free-play. Previous to my clutch work, I didn't understand what clutch pedal free-play was, and how it related to the operation of a clutch. 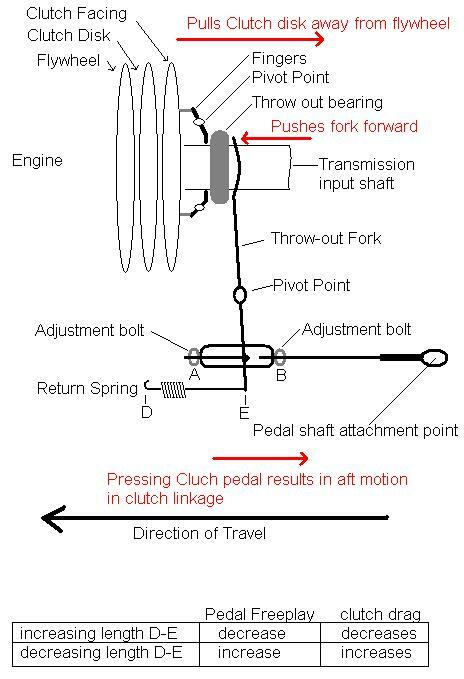 In a nutshell, clutch pedal free-play is the distance the clutch pedal travels before the throw-out bearing touches the actuating "fingers", as in Figure 1, below. Job No. 29-3 in the Mercedes Service Manual Model 190 (SM-1207-000) calls for 25mm (about 1 inch) of clutch pedal free-play. My car (with the problem) had about 2 or 3 inches of clutch pedal free-play. Apparently with that much clutch pedal free-play, the remaining clutch pedal travel is insufficient to completely disengage the clutch facing and clutch disk from the flywheel. The opposite problem, no clutch pedal free-play, means that the throw-out bearing is always in contact with the "fingers." This condition will result in worn fingers and throw-out bearing. I suppose the fingers and throw-out bearing will heat up, and seize up. Lift the front end with ramps, or lift the entire car. Optional: Measure (and record) the distance D-E from the holding plate at point D to the bottom of the throw-out fork at point E. This will become your "control distance." Hint: stick your tape measure through the longitudinal middle of the return spring. It will give you a straight line measurement of D-E. Locate and remove the return spring first at point D then at point E in the drawing above. Loosen the 17mm adjustment nut at point A. The "control distance" measurement in step 2 above will become critical. Make sure you record this distance from D-E. Locate and remove the return spring. Loosen the adjustment bolt at point A. Loosen (back off) the threaded adjustment shaft associated with point A, enough so that the oval adjusting barrel rotates downward away from the throw-out fork. Hint: the shaft of the throw-out fork is shaped like a cup which holds the end of the adjustment shaft. Tighten (or loosen) the oval adjusting barrel, so that it moves closer to the pedal shaft attachment point, effectively shortening the distance from B to the pedal shaft attachment point. Rotate the oval adjusting barrel back into position over the throw-out fork, and snug the adjustment shaft. Adjust so that the original distance D-E is retained. The throw-out fork is now back at your control distance. Now tighten or loosen the threaded adjustment shaft associated with point A. Remember: To decrease clutch drag (also decrease pedal free-play) increase the distance from D-E.
Over time, normal wear on the mechanical clutches of the Mercedes-Benz Pontons will result in a reduction of clutch pedal "free play." Free play is the distance between the throw-out bearing and the actuating fingers on the pressure plate. As the clutch disc becomes thinner from normal usage, the actuating fingers on the pressure plate will pivot closer to the throw-out bearing as the opposite end of the actuating fingers pivot closer to the flywheel, thus reducing the pedal free play. When there is no free play left, the pedal will feel stiff as soon as you press down on it. Excess pedal free play is not the result of normal wear on the clutch disk. It is not known why Ray Ilich's 220S clutch pedal had too much free play as he describes in this article. Perhaps, the clutch was replaced, and adjusted incorrectly, prior to his ownership. It was becoming more difficult to shift into reverse without grinding the gears. When I followed the adjustment process in this article, I was able to regain the required amount of clutch pedal free play, and shifting in all gears was smooth again. The other telltale symptoms did not change, however. The clutch was still making "chattering" and "shuddering" noises in first and second gears. According to the Glenn's Mercedes-Benz Repair and Tune-up Guide this can be due to various internal clutch problems. Some of those being: a warped disk, warped pressure plate, glazed linings, uneven clutch finger adjustments, oil or grease on clutch disk facings, etc. Other causes could be loose engine mounts or drive shaft supports or couplings (flex disk or "guibo" at front, or the U-joints at center and rear). I need to investigate more. I suspect that prior to my increasing pedal free play, the pedal was actuating the throw-out bearing and so the clutch disk and flywheel were not rotating at a 1:1 rate but instead, slipping against each other, which may have resulted in overheating and thus, warping the disk or pressure plate, or both. I discovered that on my 1957 Type 190, both the clutch disk and flywheel were extremely worn and the flywheel needed to be replaced. The flywheel was unusually expensive and had to be sent from Germany. There was not enough left on the old one to have it machined, and it had numerous hairline, and some larger, cracks. I also needed a new transmission mount, as the old one had disintegrated. The front motor mounts were still in good condition after replacing them 14 years (20,000 miles) earlier. Keep the clutch pedal free play adjusted within the specified tolerances, or risk wearing out the clutch prematurely.